Wonder kid Kwesi Arthur releases the remix for his critically acclaimed song, Grind Day, which has been described as the biggest hip hop song out this year. 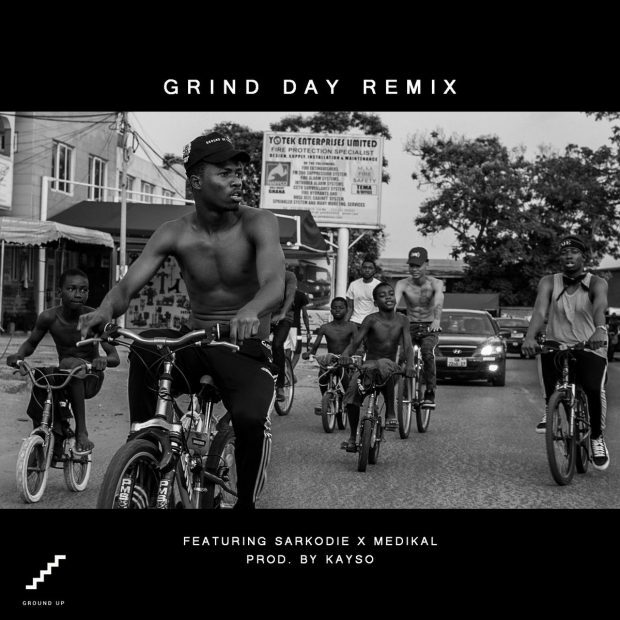 Kwesi Arthur, who was hugely accepted by a majority of Ghanaians following the release of his debut EP Live from Nkrumah Krom had the most decorated African rapper, Sarkodie, and AMG Business signee, Medikal, hop onto the remix of Grind Day. The original song, which was the second track on the EP and was produced by Kayso, saw the Tema-based rapper spit bars and talk about how one has to geddit geddit geddit to make it in life. The video was directed by Lex McCarthy, an award-winning videographer. It was shot in various parts of Tema, and the large crowds that showed up to support made sure there wasn’t a dull moment all shoot long. It is no secret that 2017 is the breakthrough year for Kwesi Arthur, whose music has been making rounds on almost all tv and radio stations, and continues to receive massive props on social media where it all began. Since the release of his EP, the young rapper has been seen on various platforms and concerts entertaining his fans. His first major appearance was at the 2017 Ghana Meets Naija concert where he was brought on stage by award-winning Ghanaian rapper, Manifest. Kwesi Arthur has proven with his Live from Nkrumah Krom EP that he is a force to reckon with. Some key industry players have been heard praising the young artist, praise well-deserved for the incredible year he’s had.